The two gold stars on the helmets of the 2018 Jackets represent Cleburne's state football championships. 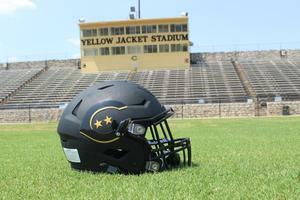 Former Jacket players and coaches are being sought for September 21 Helmet Ceremony. A Helmet Ceremony involving the 2018 Jackets and Jackets of seasons past will now be a part of the September 21 Homecoming festivities. The two gold stars surrounded by the Cleburne C emblazoned on the helmets worn by the Jackets varsity team this season is a tribute to the state football championships of 1920 and 1959. The Helmet Ceremony bringing together the CHS football brotherhood, including those of the 1959 team, will take place moments before Cleburne steps onto the field for the Homecoming game. Members of former Jacket football teams and coaches are being sought to participate in the pre-game event. The ceremony, originally scheduled for September 7, was postponed following the move of the home game to Saginaw because of wet field conditions due to rain. Jackets Head Coach Casey Walraven chose to add the symbolism to this year’s helmet wraps, which also reflects the vision of Jackets football moving forward. The stars were added to the helmets just prior to the home opener for the season, in which the Jackets came away with the win. Walraven said the gold stars tie together Cleburne’s football past, present and what is to come. Former players and coaches interested in participating in the September 21 Helmet Ceremony are asked to contact Lisa Magers, CISD director of community relations, 817-202-1127 or lmagers@c-isd.com. The ceremony will take place during the pre-game activities which begin at 7 p.m.
Two gold stars, representing Cleburne two state football championships, were placed on the Yellow Jacket varsity helmets just prior to the home opener, which ended in victory. Former Cleburne players and coaches are needed for a September 21 pre-game Helmet Ceremony, coinciding with Homecoming, bringing together Jackets of the past and present.